The first news? AUTHENTIC has won two awards!!!! The Australian Writers’ Guild awarded AUTHENTIC in the “interactive media” category for the 47th Annual AWGIES. AUTHENTIC was described as “category-busting”. I couldn’t be at the ceremony, and so I did my first pre-recorded award acceptance speech! Although there were no other nominees, I do know there were other submissions. More on this in a moment. 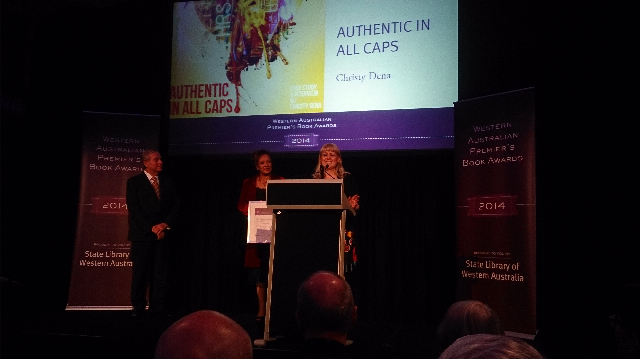 The second award for AUTHENTIC was in the “Digital Narrative” category for the 2014 Western Australia Premier’s Book Awards. AUTHENTIC IN ALL CAPS is transmedia storytelling at its finest, borrowing the best of existing narrative techniques across a range of media, harnessing these to tell a compelling story about mortality and materiality in a playful but meaningful manner. AUTHENTIC IN ALL CAPS is held together by a luscious audio story, not dissimilar to radio plays in their heyday, but now updated with interactive pathways, bespoke online locales and a series of beautifully designed interactive web pages. I was able to be at this ceremony and I had a ball! It was a thrill being driven around and toasted, and hanging with fellow award-winners. I also thanked the Premier and the Library for having this category, the only in a literary award in Australia. 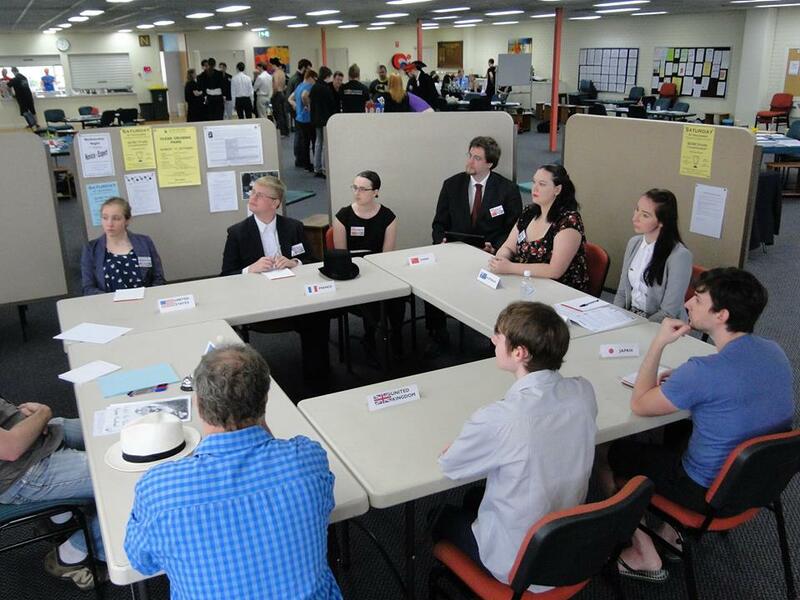 Afterwards when I was having my photo taken with the Premier he asked what digital narrative is. So if the category is suddenly removed it is because of me. I hope not, it is a wonderful thing for us. There are a couple of things I have learned from the award experience. Firstly, I now know that winners in most cases find out before the ceremony. I didn’t know this before and so when I submitted to the ADG’s award and didn’t hear anything I thought maybe I was in with a chance. Like the AWG I won, they had only one nominee and announced it on the night. So if you didn’t win you not only find out you didn’t win, but also that you didn’t even score a nomination. Both at the same time. It is a pretty crap feeling. I wish there was a different system. Indeed I did contact the ADG and suggest they let the unsuccessful nominees know. But I guess that just sounds silly in retrospect. So for those of you that submitted to the AWG Awards – I know how it feels. Secondly, I didn’t know what to do when I had found out about winning the awards. I didn’t feel like an award-winner (I submitted hoping for a nomination). There are things I would like to change in the project. Not just things that you learn over time post the project. But things that I knew at the time I needed to change but I didn’t have the budget for. At the same time, I also have people who experienced AUTHENTIC that send me emails about how much they love it. So I can’t deny their experience. In the end I have accepted the awards as a gift for all the work I have done, and I celebrate it because it means the crazy work of digital storytelling risk-takers is not always a lonely beacon. While in Perth for the WA Premier’s Award ceremony, I gave a workshop on “Making Meaningful Games” for the Film and Television Institute there. Kate Raynes-Goldie invited me and it was a delight. Among the great people I was able to meet in person finally, such as Anthony Sweet and Wesley Lamont, was Will Kirk. Will has started a gaming news site called GameCloud. He dedicates lots of time to writing articles about the local scene and beyond for no financial compensation. He is also really keen to understand more about the process of making games, to make him a better game reviewer and critic. Will shared his experience of my workshop: “Designing Deep Games with Christy Dena”. I have also been watching and discussing the crazy events that have been taking place in the gaming world these past few weeks. I have been watching for a while how different women respond to feminism and shaken my head at the anti-feminism movement. At the same time, I have also looked back at my own behaviour in the past and seen how I have done damage myself too. Specifically, one event sticks in my mind because I actively took a role: the StoryWorld Advisory Board complaint. Writer Andrea Phillips bravely put forward that the board for StoryWorld was sexist. I was the only female on the board and so I felt it my duty to say something. Although I was not intending to reduce the seriousness of sexism, I did with my response. I posted about how everyone agrees there is sexism. I now know this isn’t true, as some are still blind to it, and some deny it’s existence for various reasons. I also said that some of the criticisms about the board list were veiled criticisms of the people, rather than sexism. That I believe is still true. I then also said that I was concerned about the focus on Alison. This is also something I regret as I feel I jumped to her defence too quickly. I should have let her and others feel the depth of the experience. And further, I don’t think she did learn from the experience in the way I had hoped at the time. I am a supporter of Alison and she has a special place in my life as I mentored her many, many years ago. But I don’t think she understood the impact of having all-male boards – considering the following year no women were added to the board. I criticised women for messaging Andrea privately rather than speaking publicly. Doh! Of course they did, as there are many unreasonable repercussions of going public. I also encouraged more women to step up and take on directing positions etc. While I still want to see this more, it wasn’t appropriate to put such remarks in the middle of a discussion about sexism. There wasn’t an all male board because women don’t bother to step up. I think my post had a silencing effect, which is harmful and not helpful. So I see how I have done things that didn’t help feminism. Indeed, if men are the majority of people agreeing with you then you may want to check your internalised sexism. So I apologise for the harm I did back then, and have a bit more understanding of how early feminists can do more harm than good. My last comment is a weird but perhaps helpful discovery. For the last few months I have noticed that I can easily fall asleep on my couch, but then when I go to bed I toss and turn in eternal awakeness. I searched the Net to figure out why and found the answer. I have been scrolling through social media in the morning to wake myself up. Once I’m awake I jump out of bed. I jump on the couch, however, usually when I’m exhausted and want to flake watching a movie or something. So I have trained my body to sleep on the couch and wake up in bed. Knowing this, I reprogrammed myself by getting out of bed as soon as my alarm goes off and scrolling through social media on my couch. Now my mind knows bed is for sleep. It has worked. My pleasure.